The Nut Job made lots of money, so nobody doubted there would be The Nut Job 2. The critics are mostly silent this early. Cartoon Brew, one of the loudest predictors of doom for the first movie, and which bad-mouthed its success -- “It was a great weekend for subpar family CG films starring animals” -- has given a sugary approval for this sequel. You might have an opinion on the trailer and you might not, but if you’re over the age of six, you really shouldn’t have an opinion at all. Do you review infant formula? Do you offer critiques of tricycles? No, not everything is for you, and that’s fine. Small children whose brains aren’t fully developed yet need entertainment too, and they liked the fuzzy animals in the first film perfectly well. The implication is clear: nobody over the age of six should enjoy The Nut Job 2. Well, here’s the trailer. Do you think that you could like this? In Oakton City, which apparently has frigid winters, the urban animals led by Surly Squirrel have taken over the abandoned Maury’s Nut Shop (established 1891). Everything looks fine for them until the Nut Shop explodes. No problem; Surly leads the animals to the city’s leafy Liberty Park, where they will live as nature intended. Except that Oakton's greedy Mayor, unhappy because Liberty Park generates no revenue for the city, proposes to bulldoze the nature park and replace it with a revenue-generating amusement park. And of course you realize, this means war! So set your calendars and prepare to go nuts again on August 18. My sister feeds wild squirrels that come into her patio. They really do like unsalted and unshelled peanuts. Kids loved this movie, and most parents found it quite enjoyable also, I know I did. Gee, do you think the filmmakers have seen "The Secret Life of Pets"? 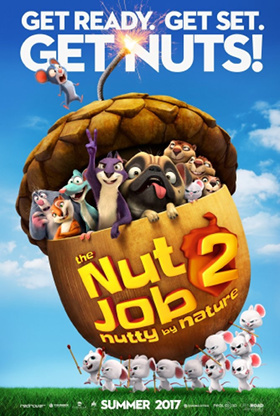 Here is the third trailer for “The Nut Job 2: Nutty By Nature”. My sister took me the the AMC Burbank 16 theater today to see it. We liked it; she liked it better than the first one. We were alone in the theatre. This matches the article on the Cartoon Brew website on August 13: “‘The Nut Job 2’ Records Worst All-Time Opening For A Film In 4,000 Theaters”. The article/review goes on: “There’s nothing even remotely close on the record books for an opening this pathetic.” Why didn’t anyone go to see it? Cartoon Brew repeated its statement that the movie was made strictly for six-year-olds, and six-year-olds don’t drive themselves to movie theaters. “But families couldn’t be bothered to see the film, most likely because adults weren’t convinced that they could enjoy the film with their kids. American animation producers have learned this lesson well, and in recent years, they’ve stopped producing strictly ‘kids’ films’ in favor of ‘family films,’ which ostensibly spread out the entertainment to both children and adults. The movie is excellently CGI-animated by ToonBox Entertainment in Toronto, with mostly South Korean investment capital. It is a direct sequel to the first movie, with some subtle changes in the setup. Surly Squirrel is now the open benefactor of Oakton’s wildlife, instead of being a secret benefactor while rival Grayson (completely missing here) takes the credit. The first movie established that Buddy the rat could talk when he wanted to; he never does in this second movie, and it’s implied that he can’t. Not only is the raccoon leader of the animals gone (he was eliminated at the end of the first movie), there is no replacement and it’s implied that the animals don’t have a formal leader. Maury’s Nut Shop, the out-of-business home of the animals that Surly has found for them, is destroyed in an explosion. Surly feels that this is no problem; the animals can return to Liberty Park, where they were before, and live off nature. But the Park is targeted to be torn up by Oakton’s corrupt Mayor Percy Muldoon (trees and flowers don’t provide the city with any money) and replaced with LibertyLand, an (unsafe) amusement park that he can charge admissions to. The animals fail to prevent the Park from being razed, but Surly gets Mr. Feng and an army of mice (“don’t call them cute”) from Oakton’s Chinatown to destroy the amusement park on its Grand Opening. The corrupt mayor is jailed, and Liberty Park is restored. There are two subplots. Surly and Andie, his girlfriend, argue through most of the movie whether the animals should live off the humans’ food as Surly wants (first the nut shop, then Surly and Buddy try to raid restaurants and doughnut shops), or if they should return to nature and natural acorns as she wants. A romance is set up between Precious the pug and Frankie, a bulldog belonging to Heather, Mayor Muldoon’s terrifyingly bratty young daughter. There were several nice bits of humor, such as Andie’s constantly-interrupted attempts to sing a musical-style song (she can’t sing, and as Surly asks. “does anyone really break into a song like in a musical? ), and the variations on “WE’RE GONNA DIE! !” The joke about the Chinese kung-fu mice being so cute is overdone. The forest animals’ war against the natural Park’s demolishers (earth mover equipment operators) and the amusement park is so open that the ending about Mayor Muldoon being arrested for safety violations doesn’t really make sense. If a bunch of terrorist animals openly destroy an amusement park and attack its human guests, how is that a safety violation that the park’s management (the mayor) is responsible for? But don’t get me started on plot holes in animated films. Plenty of more highly-rated movies have plot holes just as bad or worse. To sum up: I thoroughly enjoyed “The Nut Job 2”.. I think that most furry fans will, too.